On the 12th of September the European Parliament voted on the so called Sargentini Report, condemning the anti-democratic turn of Hungary and initiating the procedure related to Article 7 (1) of the Treaty on the European Union. The vote and even the report itself have drawn huge attention to the continuous democratic erosion in Hungary, and Orbán and his government have received open criticism that is much harsher than ever before. Up until this point Orbán's swing policy (heavily attacking Brussels in Hungary but attempting to show some cooperation within EU institutions) seemed to be successful, or at least his stronger critics have stayed in the background. That attitude began to change spectacularly on both sides approximately in 2017, when the Hungarian Government initiated a nation-wide billboard campaign with the slogan “Let's Stop Brussels”. Ever since then, Hungary's sometimes hidden, sometimes very direct anti-EU policy (which has mostly been related to false accusations regarding migration) and the many other anti-democratic steps taken prior to that have absolutely pushed Orbán to the far right, and he has therefore begun to pose a danger to the whole EU. While in recent years the EU's bureaucratic system could not do much with this growing hybrid regime hiding its autocratic steps behind empty democratic institutions, the anti-EU, anti-NGO and anti-migrant rhetoric was a very clear denial of core European values, and therefore it was easier to combat. Other European events also contributed to this harsher step being taken towards Hungary, namely, that far-right, nationalist voices have become stronger all over Europe. The EU has more to lose now than “just” Hungary since Orbán's illiberal regime is becoming an example to follow for many European radical politicians. When Orbán declared his intention to be the leader of these voices in the EU, European Parliamentarians began to realize that they needed to condemn his actions much more strongly than before and show that those who contravene the fundamental values of the EU will be punished. In order to vote on triggering the Article 7 sanctions procedure, the European Parliament needed a report investigating the situation of Hungary and proving that the values on which the EU is founded are being seriously breached. The report prepared by Green MP Judith Sargentini made this destruction very clear, and even though many governmental actions are missing from it, the list contains some of the most important violations that have happened throughout the years, including concerns regarding the constitutional and electoral system; the independence of the judiciary’, corruption; privacy and data protection; freedom of expression; academic independence; freedom of religion and association; the right to equal treatment; the rights of minorities, migrants, asylum seekers and refugees; and the abolition of economic and social rights.3 The report is based on regional and international court decisions, previous reports by EU and UN bodies and institutions, statements from local and international NGOs, and many interviews conducted in the field. It was introduced in the beginning of July, and despite widespread international media attention to it, the Hungarian Government continued to violate fundamental and human rights during the summer. In the context of the so-called “Stop Soros” law package, which was designed to dissolve the critical NGO sphere and to imprison those NGO workers and even those attorneys who attempt to help asylum seekers and other migrants, the Hungarian Parliament adopted an amendment to the tax law in July to create a special tax on immigration. The new amendment basically taxes and punishes critical voices; its definition of taxable activity is so broad that almost anything and any organization can fall under it. The tax must be paid after “the financial support for an immigration-supporting activity”4 which can be basically any activity that is indirectly or directly promoting immigration. The bill lists a few examples, such as “building and operating a network”, “organizing education”, carrying out “media campaigns”, or “propaganda activities that portray immigration in a positive light”.5 Donor organizations, mainly, should pay a tax equivalent to 25% of the amount of financial support they are providing to those conducting such activities, and if the donors are not able to, then the supported organization should pay the tax. Since this would mean a lot of money in some cases, there is a certain danger that the NGOs could go bankrupt quite quickly, and since the definition is intentionally not clear, anyone, any critical voice, can fall under it. The new bill entered into force at the end of August, but its chilling effect had already started. The biggest scandal in this respect was caused by the Central European University (CEU), which voluntarily suspended their scholarships and their program for refugees in order to avoid the immigration tax. The new “Stop Soros” package has already had other consequences as well. At the end of June the Fundamental Law of Hungary was modified for the seventh time to state, inter alia, that anybody arriving from a “safe third country” (and Hungary is surrounded just by such countries, according to the Government) shall not be entitled to asylum. Ever since the new modification came into force in July, the authorities have refused to award refugee status to anybody. When the applicants appealed, the authorities stopped providing them food and let them starve in the hope that the asylum seekers would give up and go back to Serbia. If the applicants had returned to Serbia they would have lost all chance of receiving refugee status, since Hungary was granting status just to those applicants located in the two transit zones established along the Serbian – Hungarian border. If the applicant were to voluntarily leave those zones, the asylum process would be stopped and could not be initiated again for a while. Thankfully, the Hungarian Helsinki Committee intervened and turned to the European Court of Human Rights, which immediately ordered the government to provide food to the people concerned. Whether news of these extremely anti-democratic steps contributed to the EP vote to initiate Article 7 (1) or whether that vote was just due to the Sargentini Report, the Hungarian Government has been given a strong warning that these kinds of autocratic actions are unacceptable within the EU. 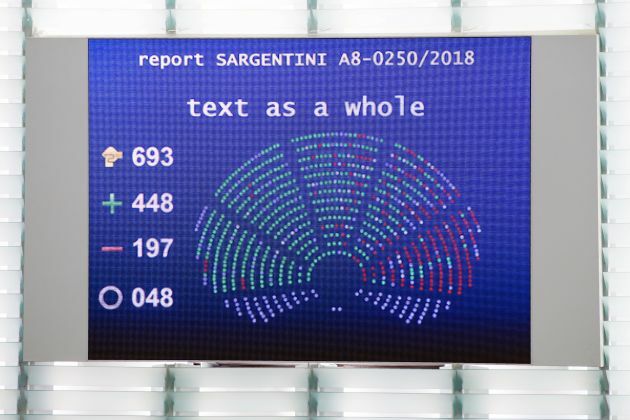 Even though the Government seemed to anticipate the report would be accepted (a week earlier the governmental media had begun reporting about alleged fraud in the EP voting system, which was their main communication also after the vote), they did not seem to expect such harsh critics even from among the European People’s Party (EPP) group, to which the governing Fidesz party belongs. This could mean that Fidesz will have to leave this group, which could have unpredictable consequences. The definite advantage would be that Fidesz's standpoint and values would be much clearer, as they would officially belong to the far right, and there would be no uncertainty anymore as to whether Hungary is still a democracy (which it is not). On the other hand, the exclusion of Fidesz from the EPP could mean they might establish and lead a coalition with other far-right and EU-sceptic parties. This could either marginalize all of them or give them a bigger voice. Despite the uncertain future, it was time to take steps in order to initiate Article 7 (1), and the move was therefore more than welcome. It was necessary not just because of the last eight years of the massive destruction of democratic values and the protection of the rights of the Hungarian people that are ensured by many EU laws and the treaty, but also because the EU must be spared from Orbán and other politicians copying the Hungarian leader’s example.